Just 200m from the University's Elephant & Castle campus, it offers convenient living within close proximity of leading attractions such as London's South Bank theatre/arts complex, the Tate Modern and the Globe Theatre. The nearest underground station is Southwark (Jubilee Line), approximately 5 minutes' walk. Waterloo Station (overland services) is also just a few minutes away. Take a tour of McLaren House. 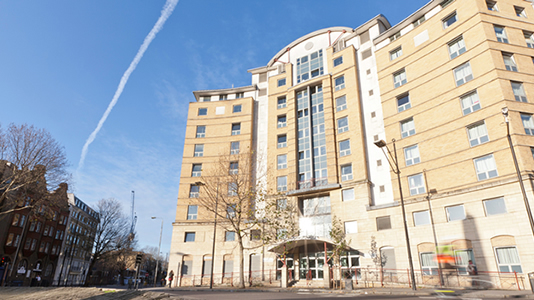 McLaren House has over 600 non-smoking rooms for first year undergraduate and returning students. The accommodation is single occupancy 'cluster flats' for mostly eight students and the vast majority of bedrooms are en-suite (shower, hand basin and toilet). Residents within each flat share a communal kitchen/dining area. Basic cleaning equipment, including a vacuum cleaner, is provided. Each flat and individual bedroom is fitted with a security lock and residents are issued with keys to their accommodation and a swipe card giving access to the building. 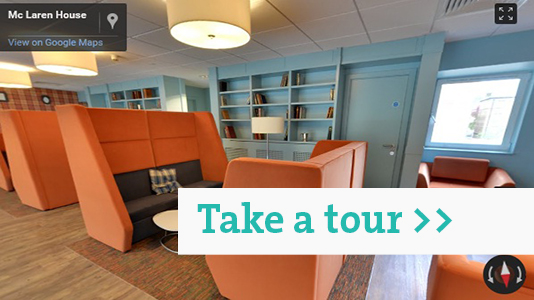 There is a central lounge and coin operated laundry and each bedroom has a data point and wifi allowing access to the University's intranet and the internet. Download photos taken in a student's bedroom and kitchen in McLaren House Halls of Residence (PDF File 624 KB) at LSBU.